Select your holiday style, we will make it for you ! How do we plan your perfect holiday in the Tirthan valley ? 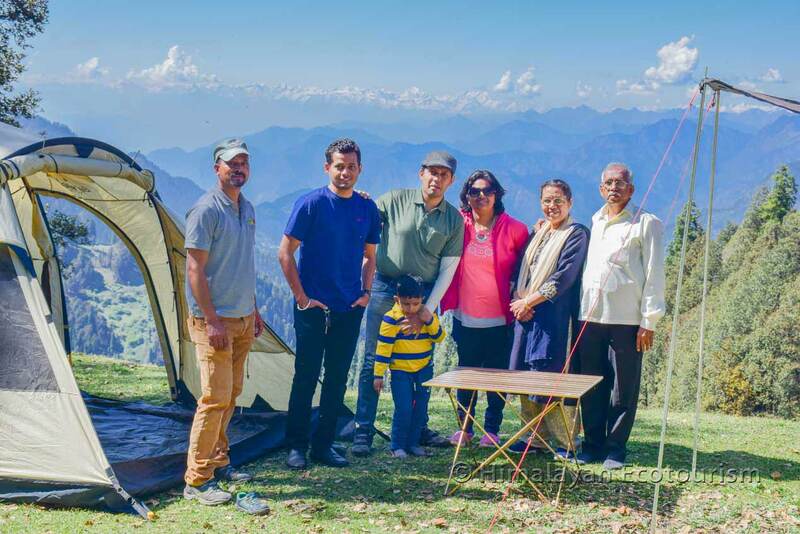 Himalayan Ecotourism makes sure you enjoy the Himalayas in a unique way, close to nature, far from the crowd, and with the required comfort and safety. All the holiday tours proposed in this page can be organized either from Delhi, from Chandigarh or any other nearby cities in Nothern India. In case you come from a further place, you will need to reach Delhi first. From Delhi you can come either by Volvo bus (overnight), by a private vehicule or even by air to Kullu (Bhunter). Select your holiday style and plan. They are explained hereafter. Send us an enquiry and we will take care of everything. The Himalayas are your next holiday destination. What is the holiday style you are looking for ? For you we have 3 styles in store ! The "hike", the "rejuvenate" and the "relax" styles. This style focus on walking into the wild with night under tents ... Actually you are trekking, so it is the most sporty style ! But this will allow you to discover the valley like no other. This style is a blend of adventure and relaxation in nature. You may have to walk on a day hike, or even have a camping night, but we make sure that you also have time to chill out ! This style is perfect for those who do not want to challenge your body. You just want to enjoy the valley in a comfortable way with great landscapes and atmosphere. Hiking, rejuvenating or relaxing ? Not sure ? Just write or talk to us, we will figure out ! This couple has selected our Platinum plan. You see them camping in the wild ! Understanding that you have different budget and different expectations in terms of comfort / luxury, we offer you 3 different level of packages : the Silver, Gold and Platinum plans. Under these plans you have different hotels, stays, different quality of camping equipment, and different food menu. Our Silver plan is perfect for those who travel on a budget. You don't mind travelling by train in sleeper class to save your money ? You are good to go for our Silver plan. If excellence is what you are looking for your holidays, just grap this plan. You will be amazed by what Himalayan Ecotourism can do ! Two days are a little short to enjoy the Tirthan valley. But perhaps you have no choice ? Don't worry, you can try our 2 day package ! Just leave Delhi Friday evening, be with us from Saturday morning to Sunday evening, and be back in Delhi by Monday, 6 am. In this package you have to select one of our two day trek. Day 1 Reaching in the morning. Trekking to your campsite. Night under tent. Day 2 Trekking back. Leaving in the evening. March to June and then September to December. Any local transportation required ? If you select the Rangthar trek, you will need to move to the village Pekhri, starting point of the trek. Yes. Serolsar lake and Rolla are the easiest treks. Rangthar is a little bit more strenuous because of the slope. 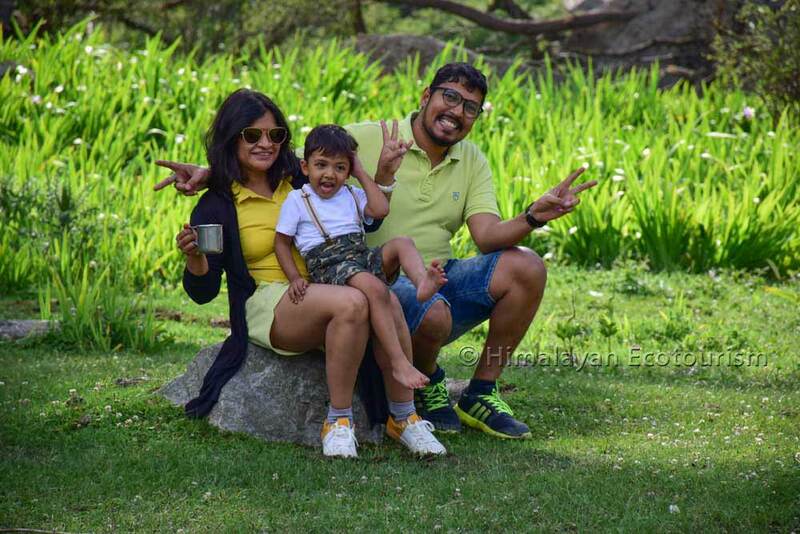 You can go for a 2 day trek with kids from the age of 5. At a lower age, you need a porter with a baby carrier. Go for an easy to moderate trek in just a weekend time. In case you come with a overnight Volvo bus from Delhi, you get off at Aut where our taxi is waiting for you. Our taxi drops you at a guesthouse/homestay where you can freshen up and relax for a while. You can also have your breakfast if you didn't have it before Aut. Our taxi takes you now to the trek starting point. If you are coming with your own vehicle, you must reach by this time at last. Meet your trekking team. Short briefing and you are good to go ! See the page of your trek for all information about your trek. By the end of afternoon you must be back at the trek ending point. Our taxi takes you back to Aut. Wait for your bus with our agent at Aut. End of our services. In this 2 day package you will experience our unique concept of "Easy camping in the wild". It is a perfect activities for those who want to enjoy the (real) Himalayan nature without an hassle. You can see the description of this activity in this page. DAY 1 - Reaching the valley. Moving to the campsite. Night under tents. DAY 2 - Coming back from the campsite. Relaxing. Leaving. Yes, because you will need to reach a distant place close to a natural campsite. It is up to you. Our campsites are within 30 minutes walking distance. You can hike further in the wild if you wish. It is suitable for anyone. 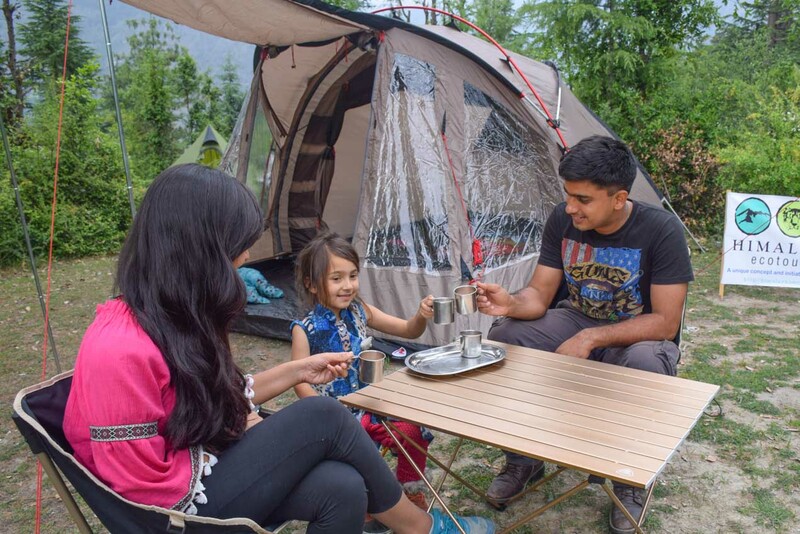 Meet the wilderness, leisurely and doing easy outdoor activities. Our taxi takes you now to the place from where you will need to walk a short distance to reach the natural campsite. If you are coming with your own vehicle, you must reach by that time at last. Meet your camping suppoprt team. Short briefing and you are good to go ! See this page for all information about your camping activity. Enjoy your lunch in a guesthouse. If you were camping somewhere in the forest we will take you riverside for your lunch. You can enjoy the riverside up to the end of the afternoon. By the end of afternoon be ready to leave. Our taxi takes you back to Aut. This package is made to ensure your complete relaxation in the Himalayas. Moreover we optimize the two days so that you enjoy a max of memorable times. DAY 1 - Reaching the valley. Free morning at the guesthouse. Easy adventure activity. Night at the guesthouse. DAY 2 - Sightseeing to Jalori pass. Relaxing afternoon by the riverside. Leaving in the evening. 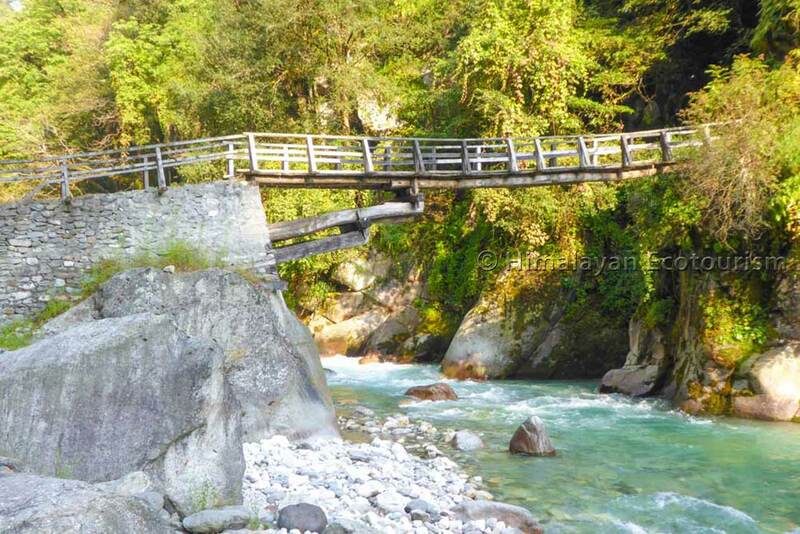 Yes, in this package you go sighseeing to various corners of the Tirthan valley. Let the mountain energies take your stress away. 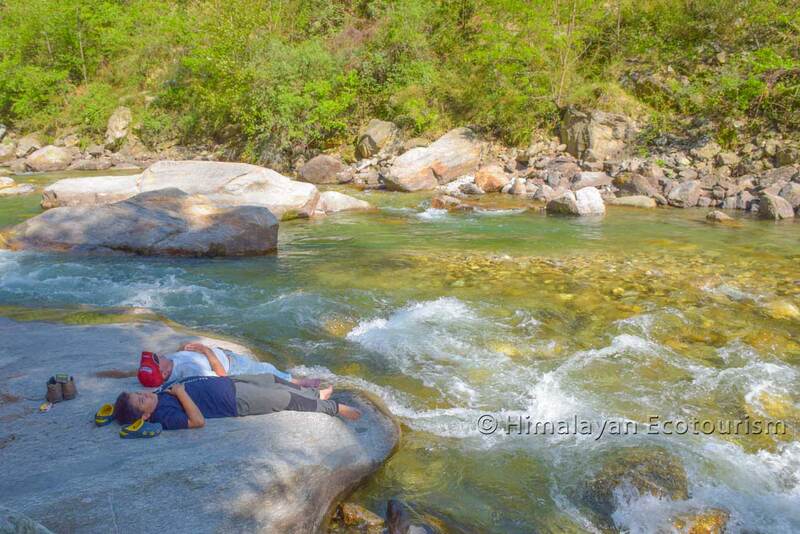 Allow yourself to have a relaxing 2 day holiday in the Tirthan valley. Our taxi drops you at your guesthouse/homestay where you will spend the night. You can also have your breakfast if you didn't have it before Aut. Rest and recover from your night. Did you have a good night on the way to Tirthan ? Anyway. This morning is free so that you can rest if required. In case you aere in good shape you can already stroll to visit the surroundings. After a relaxing morning enjoy a good meal and get ready for the activity of the afternoon. Activities available : Rappelling (a lot of fun), river crossing (thi too) or fishing. In case you up to it you can also go for a short hike to a waterfall. Back at the homestay/guesthouse you will have a snacks with tea/coffee. Spend your evening time leisurely by the riverside or any other natural place around. Have you dinner. Good night. After the breakfast, our taxi will take you to an exceptional place where you can enjoy the landscapes and the natural atmosphere of the Himalayas. Jalori pass is an excellent option, but there are plenty of other ones ! You are back at the homestay/guesthouse for your lunch. Then you can spend your time resting, reading, or any other relaxing activities. Let's know if you are again up for another adventure activity. Get ready and get in our taxi for a driv to Aut. A long weekend ahead ? You have 3 days in hands ? Good enough ! Join us for a great Himalayan experience : hiking, rejuvenating or simply relaxing. 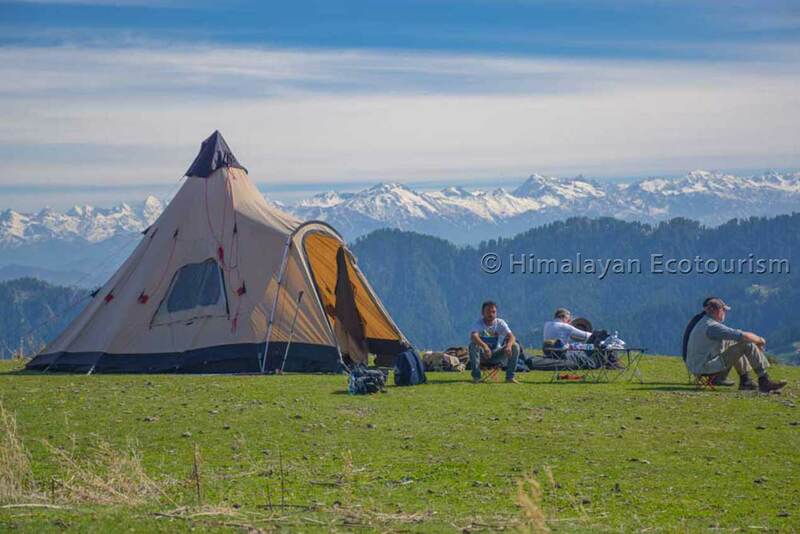 In this package you have to select one of our three day trek in the Great Himalayan national Park. We take care of all the logistic support. 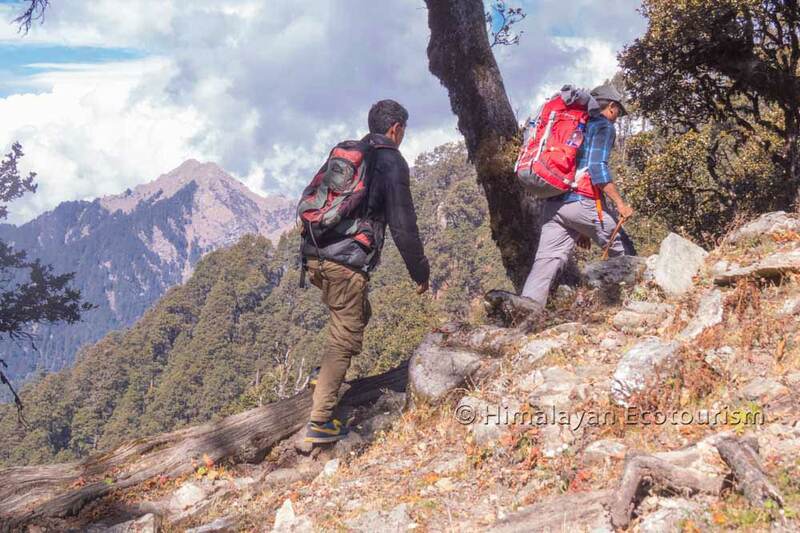 Read the practical information about trekking with us. DAY 1 - Reaching in the morning. Trek to the camp one. DAY 2 - Trek to the camp two. DAY 3 - Back from trek. Leaving in the evening. If you select the Marahni trek, you will need to move to the village Pekhri, starting point of the trek. Yes. But the proposed treks remains accessible for anyone who has an average firtness. Please check here for the required fitness. You can go for a 3 day trek with kids from the age of 5. At a lower age, we recommend you to go with an extra porter and a baby carrier. In both cases (Shilt hut or Marahni) you have a choice either keeping your camp where you spent your first night or you can push it ahead to the next basecamp. The first case is for those who are not sure about the physical fitness. You go for for a day hike from your basecamp where you spend both the nights. The second requires more stamina as you will have to come back all the way from the second camp in one day only. In this package you experiment our concept of "Easy camping in the wild. This is a one night activities for those who want to enjoy the (real) Himalayan nature without an hassle. Day 1 - Reaching in the morning. Relaxing. Moving to the campsite. Enjoy the wild. Night under tent. Day 2 - Packing up. Lunch at the guesthouse. Adventure activity. Night at the guesthouse. Day 3 - Morning hike to a waterfall. Relaxing afternoon by the riverside. Leaving in the evening. A gentle walk only. The adventure activities is not demanding in terms of stamina. It is suitable for anyone. Young kids or senior persons may not be able to do the adventure activity but they will have fun watching the others. The perfect package for those who wants to experience the Himalayan wilderness but who are uncertain.